Vatican City, Oct 5, 2017 / 04:49 am (CNA/EWTN News).- As the Chaldean Catholic Church begins their annual synod, Pope Francis kicked the meeting off by telling leaders of the eastern rite that given the new apprehensions arising from increasing political instability, they must urgently work to promote unity at all levels of society. This unity is especially important between pastors of the Chaldean Catholic Church and leaders of other Catholic rites in the area, who should work together in “promoting dialogue and collaboration among all the actors of public life” in helping to facilitate the return of displaced persons and to heal divisions, he said. “There is need for a process of national reconciliation and of a joint effort of all the components of society, to reach shared solutions for the good of the whole country,” he said, and voiced his hope that the “strength of spirit, hope and industriousness” characteristic of Iraqi society would never diminish. Pope Francis spoke to participants in the Synod of the Chaldean Catholic Church, which is taking place from Oct. 4-8 in Rome,and comes on the tails of a recent Aid to the Church in Need conference on rebuilding towns and villages on the Nineveh Plains, during which Patriarch Luis Rafael Sako, Chaldean Patriarch of Baghdad, was a keynote speaker. In addition to new fears and uncertainties roused by the recent referendum vote to liberate Iraqi Kurdistan from the Iraqi central government, making it an independent state, other talking points in the Chaldean synod will include forced migration, the return of displaced persons, the rebuilding of villages on the Nineveh Plains, Chaldean Church law, liturgical topics and vocational pastoral activities. The Pope also urged Chaldean Church leaders to work together with the Latin Church to address the diaspora of their faithful throughout the world, with an eye to the local ecclesial contexts in which they live, both from a numerical point of view, and that of religious liberty. 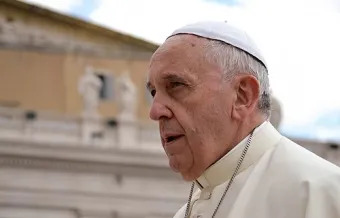 Vatican City, Jan 29, 2019 / 08:22 am (CNA).- Unity and fidelity in a Christian marriage can offer an example of true love to the world, Pope Francis said Tuesday. 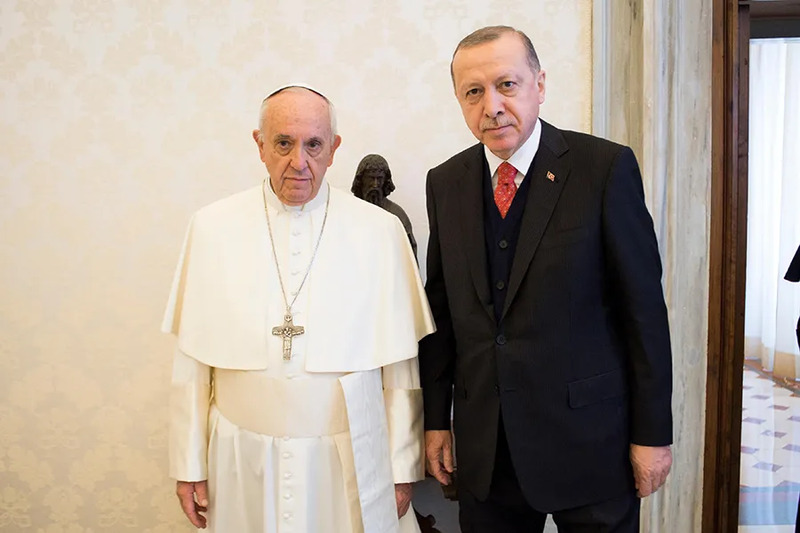 Vatican City, Feb 5, 2018 / 01:00 pm (CNA/EWTN News).- On Monday, Pope Francis and the president of Turkey, Recep Tayyip Erdo?an, met at the Vatican, discussing the situation in the Middle East, in particular the status of Jerusalem, and the need for peace and stability in the region. The two also discussed the bilateral relations between Turkey and the Holy See and the condition of the Catholic community in the country, as well as the challenges of receiving refugees and the efforts being made in this regard, the communique stated. This was the second meeting between the two leaders and the first time a Turkish president has visited a pope in 59 years. The first meeting between Francis and Erdo?an occurred Nov. 28, 2014, during the Pope’s three-day visit to Ankara and Istanbul, Turkey. Near the end of their meeting, the Pope gifted Erdo?an a small medallion, depicting an angel of peace choking a demon of war, and told Erdo?an that it is the symbol of a world based on peace and justice. He also gave the president an etching of St. Peter’s Basilica, depicting the basilica as it looked in the 1600s, as well as the customary gift of copies of his environmental encyclical Laudato Si and his message for the World Day of Peace 2018. He also gave the Pope four books by Rumi Mevlana, an Iranian theologian who lived with dervishes in Turkey for many years, along with a copy of the Masnavi, which is a poem written by the Persian Sufi poet Rumi, and as two books about the poet’s life. Afterward, Erdo?an met with Secretary of State Cardinal Pietro Parolin and Secretary for Relations with States Archbishop Paul Richard Gallagher. Kurdish demonstrators in Rome protested the meeting, because of Turkey’s military offensive on Kurdish areas in northern Syria, which began last month. When Erdo?an left the Vatican, protesters tried to make their way into St. Peter’s Square, but were stopped by riot police, and at least one person was injured in the altercation. Demonstrators had also tried to enter St. Peter’s Square on Sunday, but were blocked by police. 150 protesters also set up on Monday near Rome’s Castel Sant’Angelo, a monument close to the Vatican, holding Turkish Workers’ Party (PKK) flags.